July is the month when my eight zucchini plants produces more zucchini that I can keep up with. I pick quite a few of them each day; as you can see below, each plant produces lots of them. My parents never pick zucchini when they are small. That would be wasteful! Why not wait until they are larger, and thereby get a lot more food out of them? Like good Calabrians, my parents have many ways to preserve zucchini for the winter. In fact two of my favorite recipes that preserve zucchini use only large zucchini. One method is to dry the zukes in the sun during the summer; they are then called cose siccati or seccatini. The other is to cook them with vinegar and preserve them with olive oil, garlic, fresh mint and hot peppers, known as zucchine sott’olio. I love them both and a large portion of my zucchini end up preserved both ways. Both of these recipes are included in the preserves section of my upcoming book. 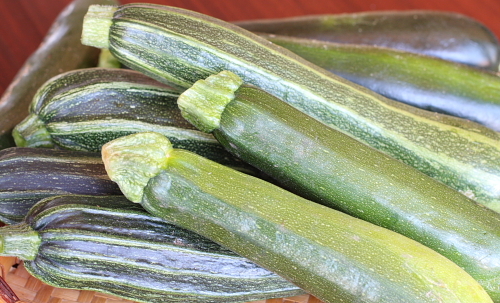 I love zucchini every which way you can think of and I prepare them in many dishes from appetizer to dessert. I will share more of my zucchini recipes that didn’t make it in my book in the coming weeks. I even started doing a cooking class a couple of years ago where the entire menu is based on zucchini. In fact this class is coming up on July 24, and if you are interested in attending it there are still some spots available. Today, the first recipe that I will share is one that my mom would always make for me as a snack, and it is now my children's favorite summer snack. They are zucchini fritters: pitticelle di zucchine in Calabrese, or frittelle di zucchine in Italian. My mother would fold some zucchini slices into a simple batter and fry each individual fritter. But when she started making these for my kids she noticed that they would pull out the zucchini slices and eat just the fried dough. So she started chopping the zucchini and fold them into the batter. This did the trick. I will show you both ways and you decide which way you prefer. Eat them as an appetizer or as a snack. The problem is you can’t stop eating them. Slice the zucchini into ¼ inch rounds, or dice the entire zucchini. Prepare the batter by mixing flour with salt, parsley, basil, grated pecorino cheese, egg and water. 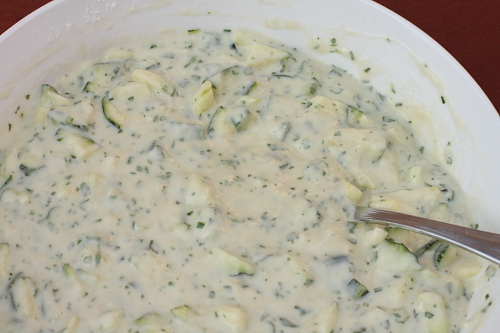 Place the zucchini rounds on top of the batter or fold the diced zucchini into the batter. Here is what they look like when done. The top photo has fritters with sliced zucchini and the bottom photo fritters with diced zucchini. In a bowl, sprinkle the zucchini with salt and toss to coat. Let stand 10 minutes to draw out some of the water. Make the batter: Mix the flour and salt in a bowl and make a shallow well in the center. Place the beaten egg, cheese and herbs in the well and mix into the flour with a fork. Add the water and beat well until the mixture resembles thick pancake batter. When you lift some batter with the fork, it should fall in a ribbon. If the batter is too thick, add more water, a teaspoon at a time. If too thin, add a little more flour. Heat 1/4 inch of olive oil in a frying pan over moderate heat until it sizzles when you insert the end of a wooden skewer or chopstick (about 365ºF). Drain the zucchini but do not rinse. Put a half-dozen slices of zucchini on top of the batter and spoon batter over them to coat. Transfer the battered zucchini to the hot oil with the spoon, making sure they are completely coated. Continue adding battered zucchini to the frying pan until it is filled but not crowded. Fry zucchini until golden brown on both sides, turning with a fork halfway through. Transfer with tongs to paper towels to drain. Repeat battering and frying zucchini until done. Let cool 5 minutes before serving. If you choose to make the fritters with the zucchini diced, fold them in the batter and using a spoon transfer a spoonful to the hot oil. Fry the zucchini fritters until golden on both sides, turning with a fork halfway through. Transfer the fritters to paper towels to drain. Repeat until all the batter is used.